Cole Elshere rides Smith, Harper and Morgan's Flaming Desire for 89 points on Thursday night to take the saddle bronc riding lead at the American Royal Rodeo at the Sprint Center. I thoroughly enjoy meeting new people, telling new stories. That happened Thursday night at the American Royal Rodeo when Cole Elshere took the lead in saddle bronc riding on a great horse, Flaming Desire from Smith, Harper and Morgan Rodeo. 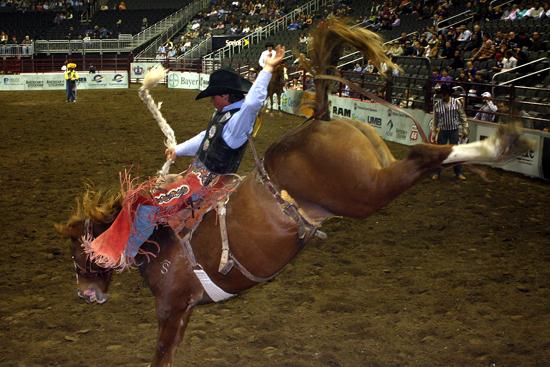 The horse has been selected to work the Wrangler National Finals Rodeo for the fourth time. I hope readers of The Kansas City Star see what a great event is happening at the Sprint Center when they read the story.